This is it. Tuesday, July 18th marks the 200th anniversary of Jane Austen's death. Or as some call it, her immortality. Two hundred years and her novels—Sense and Sensibility (1811), Pride and Prejudice (1813), Mansfield Park (1814), Emma (1815), Northanger Abbey and Persuasion, both published posthumously in 1818—are just as popular as they ever were. Her novels have rarely been out of print, with new adaptations and re-imaginings constantly in the works. Yet when she died in 1817, she died without fame or fortune from her work, her genius for biting social commentary not widely recognized. This year Austen fans around the world have been celebrating the author with all sort of special events and in September Austen's face will appear on England's new £10 note. I wonder what she'd make of that! From Pride & Prejudice and Zombies to Austenland, from Death Comes to Pemberley to an episode of Wagon Train in 1959 and even the children's show Wishbone—about a dog, no less— in the 1990's, Jane Austen is credited with over 73 productions on imdb.com. Her reach extends far and wide, a source of inspiration for writers and a treasure for film and television fans. The creme de la creme for me remains the 1995 production of Pride & Prejudice starring Colin Firth as Mr. Darcy with Jennifer Ehle as Elizabeth Bennet. The six hour mini-series is my #SaturdayMatinee, available to stream anytime on Hulu, Amazon and YouTube. Do I need to tell you how faithful to the book, how witty and wonderful it is? 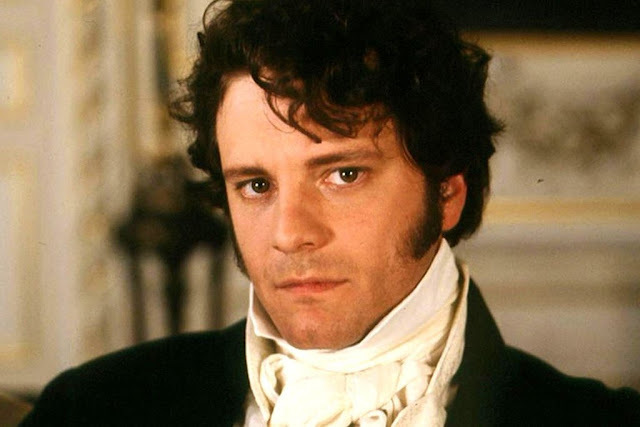 But there are so many different Austen adaptations and inspirations to watch. Netflix DVD has 20 titles in their library, many of which are available to stream on Netflix too. I know, I know, there are others. The Cate Morland Chronicles is the most recent, a British television series about a young grad student, based on Northanger Abbey. I read that back in the 70's but sorry, I don't remember a bloody word! Beyond the novels are the novellas like Lady Susan which was made into Love & Friendship in 2016 with Kate Beckinsale and Chloe Sevigny. I've just discovered Lost in Austen a comic work inspired by Austen's work. With four episodes to watch on Hulu, I'm giving it a go. 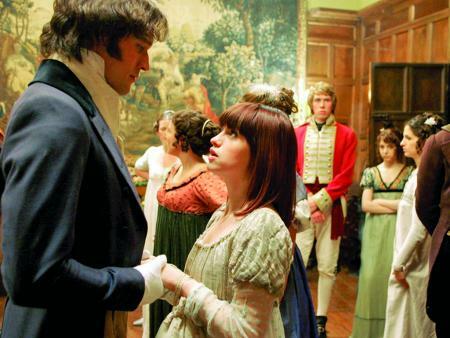 The 2008 miniseries has a cast that includes Hugh Bonneville as Elizabeth's father, Mr. Claude Bennet, immersing the modern day Amanda Price (Jemima Cooper) in the world of Pride & Prejudice just as we meet their new neighbor Mr. Bingley. From Hammersmith, her presence throws a bit of a hammer into the works. I believe you will find it most amusing! 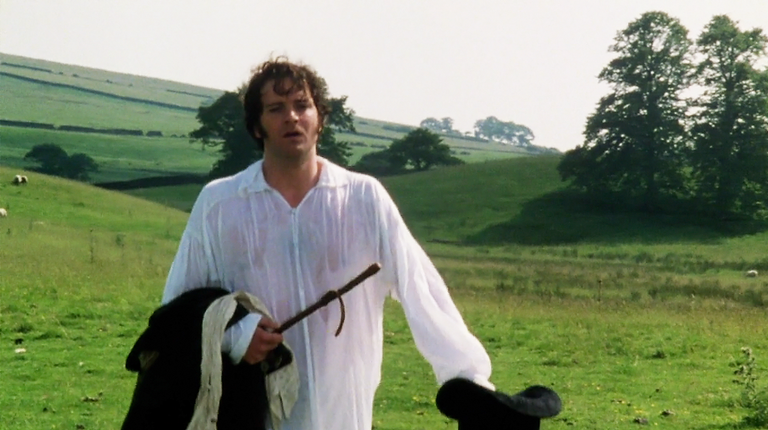 In Lost in Austen, the Pride & Prejudice obsessed Amanda Price says even Colin Firth isn't Colin Firth. She makes Mr. Darcy (Eliot Cowan) take a dip to see how he measures up to her fantasy. Does he? And you? 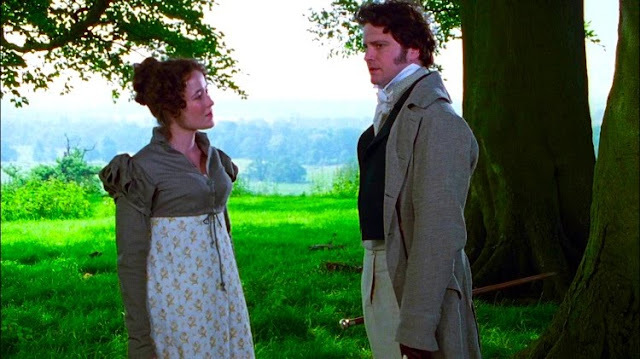 What's your favorite Austen adaptation?